Agricultural mechanization—the use of machine and animal power for plowing, threshing, harvesting, and other tasks—is playing an increasingly important role in Africa’s rural transformation. Rapid urbanization puts African farming systems under pressure to produce more with less labor, as more people migrate to cities or engage in rural non-farm work. In response, farmers in many parts of Africa have exhibited increased demand for mechanization. Our recent research in Ghana addresses the relationship of agricultural mechanization and economic transformation and suggests how government policies can support this process. Rapid urbanization leads to increased market demand for agricultural products such as cereals, which require more labor than other crops. Growth of medium-sized farms. Large farmers in Africa have historically used tractors for land preparation; now tractor ownership among medium-scale farmers has started to emerge. Tractors not only allow these farmers to expand the size of their farms, but also to provide plowing services for nearby farmers. Rising rural wages and seasonal labor shortages have driven up demand for mechanization among smallholders. The availability of tractor plowing services enables many small farmers to plant their crops on time. 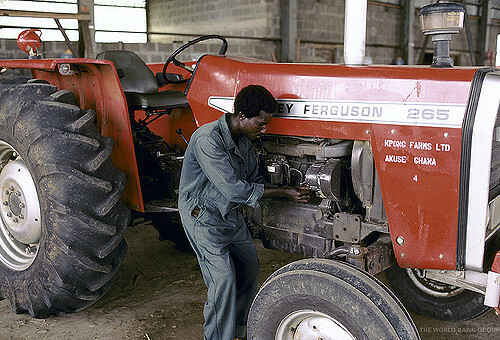 The rising demand for mechanization and the increased number of medium-scale farmers owning tractors have created a private mechanization hiring market in Ghana and increasingly in other countries in Africa south of the Sahara, which allows tractor owners to fully utilize their machines while providing services to farmers who cannot afford their own tractors. Recent evidence from Africa and elsewhere suggests that a such a market is the most efficient mechanism for supplying mechanization. However, the mechanization market in much of Africa is still at an early stage of development, and the inevitable market failures require government action. For example, the up-front cost of purchasing a tractor is prohibitively high for many potential owners where credit markets are thin or absent. Private banks are often reluctant to lend to farmers for machinery investment, as many land tenure systems make registering collateral difficult. Likewise, tractor owners may not have enough knowledge and information to connect with potential consumers, which increases the risk of investment in a tractor. Local governments can facilitate a better connection or coordination between demand and supply of tractor services and help tractor owners link to clients in other parts of the country. Governments can support research and development to manufacture smaller machinery suitable to local conditions and demonstrate its advantages with training programs. Smaller machinery is less costly, but would-be buyers, private traders, and small farmers must still have sufficient knowledge to operate and maintain the equipment. Governments can also lower tariffs for imports of spare parts and consider promoting suitable attachments to outfit tractors for functions other than plowing. However, direct government intervention in the mechanization market is often an inefficient substitute for the workings of the market itself, and can further delay market development. Officials should learn from, rather than repeat, the long history of failures of government-run or government-subsidized hiring services. Government interventions are less likely to boost the adoption of mechanization when local demand is weak. Where demand demonstrably exists yet markets fail, governments efforts should focus efforts on supporting the private sector to promote the availability of machinery and mechanized services. Project Paper: Can The Private Sector Lead Agricultural Mechanization In Ghana? Xinshen Diao is Deputy Division Director and a Senior Research Fellow in IFPRI's Development Strategy and Governance Division (DSGD); Dr. Diao co-leads PIM's research flagship on Economywide Factors Affecting Agricultural Growth and Rural Transformation. Jed Silver is a DSGD Research Assistant and Hiroyuki Takeshima is a DSGD Research Fellow. This story originally appeared on IFPRI blog. Research featured in this blog was undertaken as part of the CGIAR Research Program on Policies, Institutions, and Markets (PIM) led by the International Food Policy Research Institute (IFPRI). Funding for the study was provided by PIM and the United States Agency for International Development through USAID’s support to IFPRI’s Ghana Strategy Support Program and Nigeria Strategy Support Program, as well as to the Feed the Future Innovation Lab for Food Security Policy. CGIAR is a global research partnership for a food-secure future. CGIAR research centers and programs are financially supported by the CGIAR Funders.